To submit for AMSAT awards, you need to send copies (you may reduce the size to fit more on a page as long as I can read the QSO information) of the front and backs (if there is QSO information there) of your confirmed QSL cards (eQSL cards are not valid for AMSAT or ARRL awards. 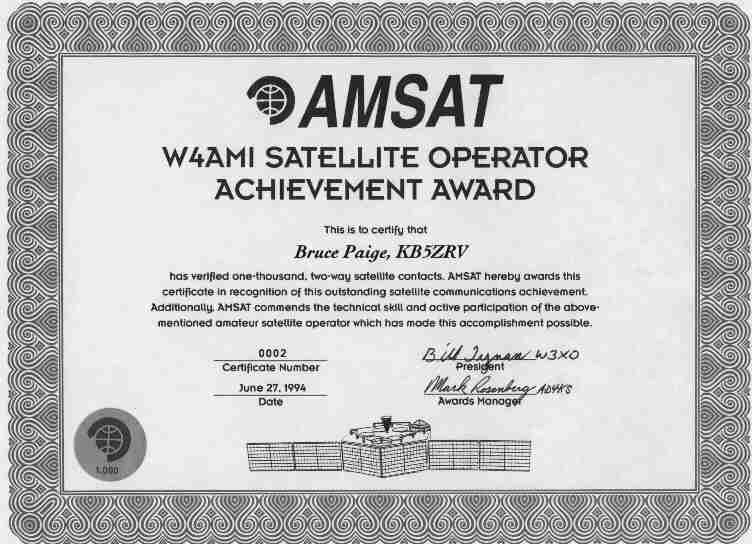 Email confirmations of a QSO is also not acceptable) to AMSAT Director of Contests and Awards, Bruce Paige, KK5DO. The cost (unless otherwise noted below) is $5.00 for members (include your membership number) and $10.00 for non-members. Please note that U.S. Postage rates now require envelopes with stiffeners in them to go as first class small packages. Postage is $1.12 within the U.S. and $1.52 for overseas (as of May, 2013 postal rates). Now that the AMSAT Online Store is in full operation, AMSAT is offering the ability to apply for and pay for any of the AMSAT Awards online. To take advantage of this program, you need to scan your QSL cards (back only required if QSO info appears there). Send them as JPG or GIF files attached to your email. You may also put the images in a Word Document or an Adobe PDF document. Email your file to the AMSAT Director of Contests and Awards (presently, Bruce, KK5DO), and indicate which AMSAT Award you are applying for and your name as you want it to appear on the certificate. After your application has been accepted and approved, you will receive a reply email instructing you to make your payment. You may then go online to the AMSAT Online Store, http://www.amsat.org and make your payment. Your certificate will then be sent to you using the shipping address you used with the online payment. 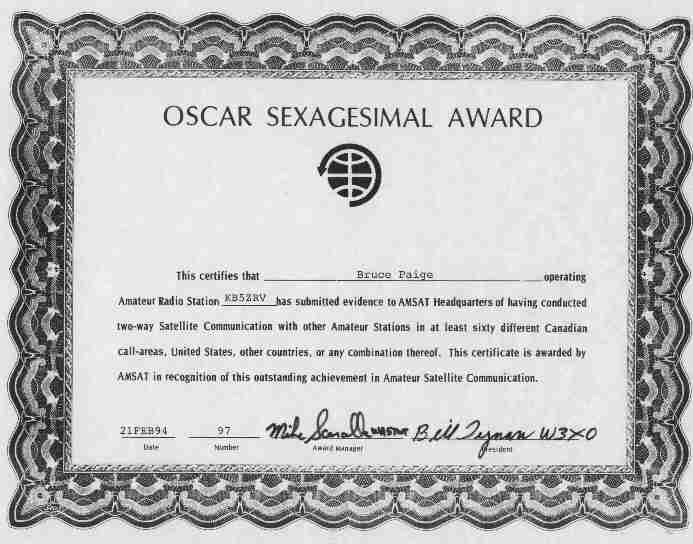 Those without scanners may still send the Xerox copies of their QSL cards to the AMSAT Director of Contests and Awards and then pay for the awards online after they are accepted. 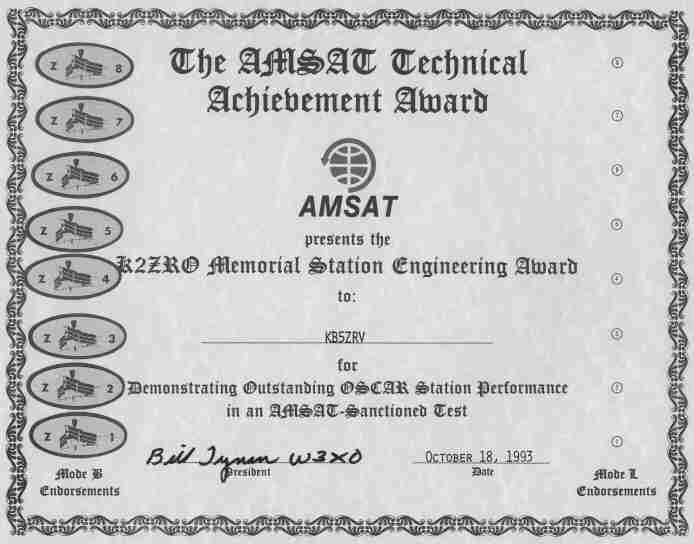 2015 AMSAT will now accept ARRL LOTW entries towards all of the AMSAT awards. Log into your LOTW account, click on 'Your QSOs'. Select the station you want to include for your AMSAT award. Click on 'Details'. Use a screen capture program or Windows Snipping tool and attach that screen shot. The information displayed contains both callsigns, the DXCC entity, the Grid Square, the time/date and mode for the contact. Everything we need for the contact to be accepted. Attach the jpg files to your email or put them in a PDF file and email them to me along with any scans of cards you will also be using. 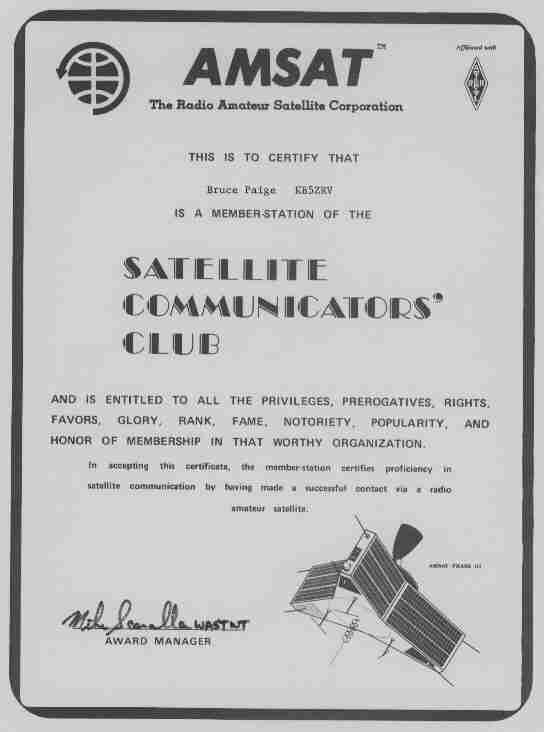 The first award is the Satellite Communicators' Club. This award is given to any operator for having made their first contact. To apply for this award you need to send a report of your contact (no QSL card is required) to AMSAT Director of Contests and Awards, Bruce Paige, KK5DO. You also need to send $1 for members and $2 for non-members. Please note that U.S. Postage rates now require envelopes with stiffeners in them to go as first class small packages. Postage is $1.19 for one award and $1.40 for two or three awards in the same envelope within the U.S. (as of January, 2014 postal rates). For overseas, one award/two or more awards... Canada $2.50/$2.71, Mexico $2.97/$3.64, all other countries $3.23/$4.50 (as of January, 2014 postal rates). The next award takes a little bit more work. It is the Oscar Satellite Communications Achievement Award. This is for working 20 contacts on any satellite. A contact is defined as one with a station in another state, DXCC country or Canadian Provience. Once you have a contact with a station in that area, you must hunt for another. So, if you work 6 canadian stations that are all in Quebec, then you can only submit one of them towards this award. For those that have the RAC CANDADAWARD or ARRL WAS with satellite endorsements, you may submit a copy of your certificate as proof of working the 13 Canadian Proviences or 50 U.S. States. The next award is the Oscar Sexagesimal Award. This is the same as the Oscar Satellite Communications Achievement Award but is given for 60 contacts. All the qualifications and costs are the same. Next there is the Oscar Century Award. This is the same as the other two awards but is for 100 contacts. Qualifications and costs are the same. Please note that the previous 3 awards are aggregated. Once you have worked your 20, that applies towards your 60 so you only need 40 more contacts. The same is true for the 100, once you get your 60, you only need 40 more for your 100. 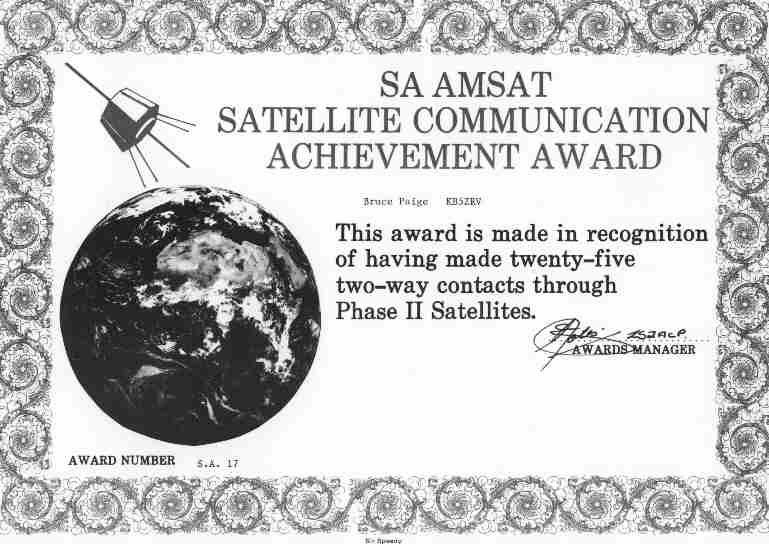 South Africa has a nice award it is called the South Africa AMSAT Satellite Communication Achievement Award. It is for 25 different stations on phase 2 satellites. Satellites that qualify for this award are AO-7, Fuji-Oscar 20/29, AO-21, AO-27 and RS-10/12/15, UO-14, AO-49, SO-50, AO-51 and future satellites that are LEO. These contacts may all be in the same state or Canadian call area. You only need 25. AO-10, AO-13 and AO-40 contacts do not count. The costs are the same as previous awards and are also sent to AMSAT Director of Contests and Awards, Bruce Paige, KK5DO. 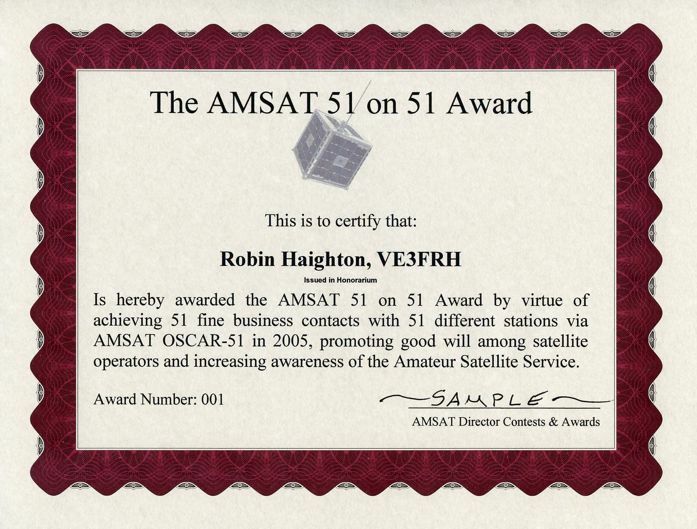 The AMSAT 51 on 51 Award is given to any station that makes contact with 51 different stations on AMSAT's newest satellite, AO-51, during the year 2005. The award is designed to promote friendship, and encourage contact with handheld and first-time satellite users. Applicants are encouraged to include contacts with stations making their first satellite contacts. Contacts may be in any mode (Voice/Packet/PSK-31) and on any band (V/U, V/S, L/S, L/U, H/U). To receive the award, you must submit your log entries either electronically or by photocopy. Entries must indicate date and time (UTC) of the contact, callsign and grid square of the contacted station, and mode used. Only contacts made between 1 January, 2005 and 31 December, 2005 are eligible. Logbooks may be submitted until 30 April, 2006. QSL cards are not required, however logbooks may be checked against other applicant's logs. 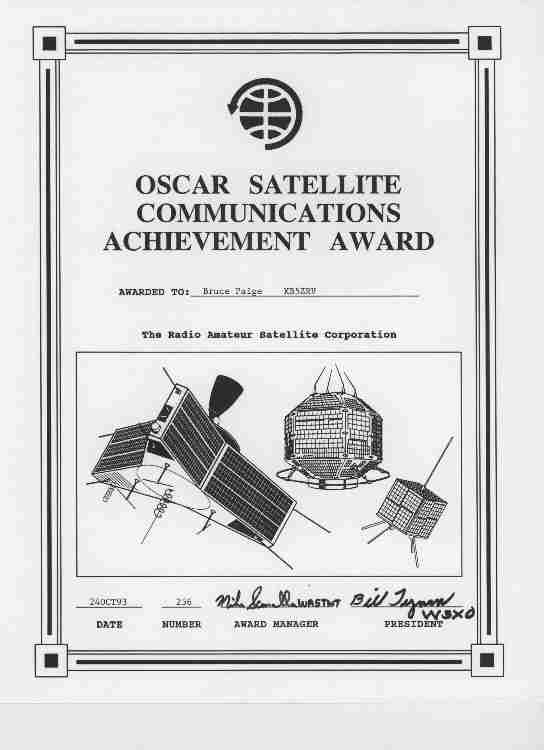 Production costs for this award have been underwritten by an anonymous donor to honor Robin Haighton VE3FRH who served as AMSAT President during the construction and launch of AO-51. Consequently all award fees will be applied to the AMSAT Eagle fund. The donation for the award is $10.00 (US Funds) and AMSAT members receive a $5.00 discount. Award fees may be paid through the AMSAT Online Store once you have received confirmation of eligibility from the Director of Contests and Awards. The K2ZRO Memorial Station Engineering Award is an award for station excellence in receiving. Periodically during the year, W5ACM, Andy MacAllister will conduct this test. He transmits a series of 5 digits at becon strength in CW on AO-13. He will then reduce his power by 50% or 3db. He transmits another series of 5 digits. He will continue to reduce power by 50% until he is transmitting at 30db below beacon strength or level A. You attempt to copy the 5 digits to the level you can hear and send your report to Andy MacAlister, 14714 Knightsway Dr., Houston, TX 77083 along with the usual $5.00 for members and $10.00 for non-members. Please note that U.S. Postage rates now require envelopes with stiffeners in them to go as first class small packages. It is $1.50 within the U.S. The first time you submit, you will receive a certificate. After that, you will receive endorsement stickers to place on the certificate. There is no fee for the endorsement stickers other than 1 unit of postage. Although this test can no longer be done, if you copied any of the previous tests, you may still submit for the award. Another satellite award is the Robert W. Barbee Jr., W4AMI Satellite Operator Achievement Award. It is awarded for the submission of 1,000 satellite contacts on OSCAR-6 or later satellites. There is an endorsement for each additional 1,000 and a special certificate at 5,000. To receive the award, send $5.00 for AMSAT members or $10.00 for non members and postage. Postage is $1.12 for one award and $1.52 for two or three awards in the same envelope within the U.S. (as of May, 2013 postal rates). For overseas, $1.52 for one award and $2.05 for two or three awards in the same envelope (as of May, 2013 postal rates). Send to AMSAT Director of Contests and Awards, Bruce Paige, KK5DO. So if you have 1,000 or more contacts on satellite, send in for this nice award and get one of the low numbers. Remember to keep your log of every contact. Every time you say hello to your friend on a satellite, log it. In no time at all, you will have enough for the award. There is an award from the VHF/UHF Society called VHF/UHF Century Club or VUCC and it is for working 100 different grid squares and you can receive it with satellite contacts. Endorsements are for each additional 25 grids worked. You can get information and an application from ARRL by visiting their website at http://www.arrl.org. Another award from the ARRL is the Worked All States or WAS. For this you must contact a station in each of the 50 states. Here again, you can request an application from ARRL headquarters. There is no 5-Band WAS for Satellite. One that is not very difficult is the WAC or Worked All Continents. This requires contacting a station on each of the 6 continents. This award is also administered by the ARRL. Cards and application must be sent to the ARRL, there is no other way to receive this award. 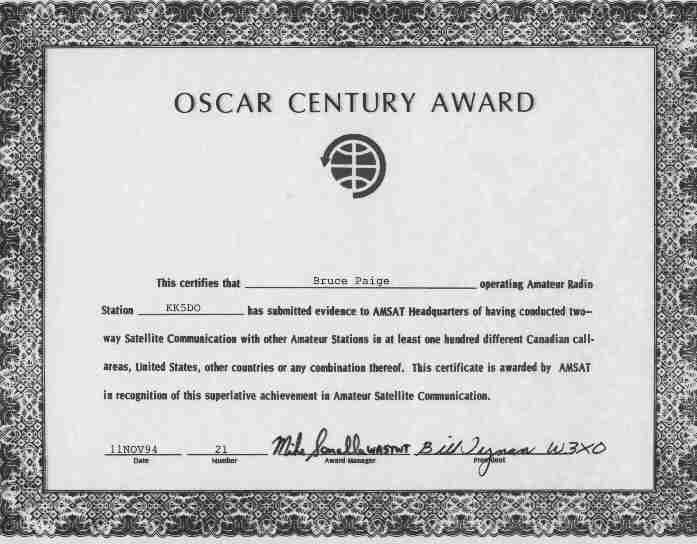 The award that is the most difficult to attain on satellite is DX Century Club or DXCC. This requires contacting 100 different DXCC countries on satellite and getting QSL cards out of them. Applications are available for the ARRL. There you have it some of the awards that are available to you for all your hard work on the satellites. Some of you may not have even known about some of them and may have enough QSL cards to qualify now. Again, the address for the AMSAT awards is KK5DO, Bruce Paige, PO Box 310, Alief, TX 77411. For ARRL, visit http://www.arrl.org The ARRL awards require you to send the actual QSL cards to a Certified QSL manager. Either I can check your QSL cards for ARRL VUCC, ARRL WAS or ARRL 5BWAS or you can find another ARRL Awards Managers perform the task.